With Summer Holiday at the front, your travel web diary will quickly switch to a beautiful, sunshiny look. 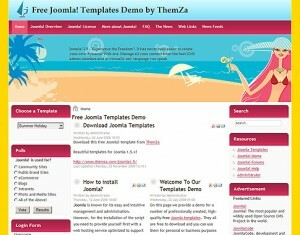 This new Joomla 1.5 template features a large sunny banner area exhibiting an idyllic summer seaside view. The theme is also fit for building an online tourist agency portal, trip destination guide or sunbathing accessories store. 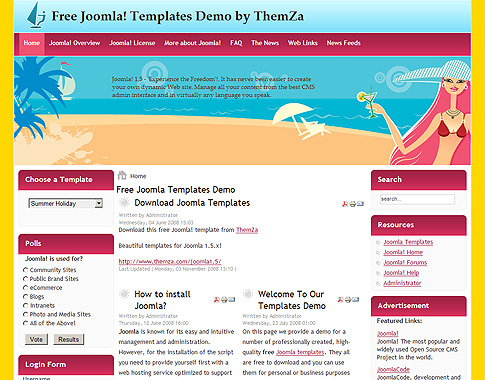 This entry was posted on Friday, July 22nd, 2011 at 10:14 am	and is filed under Joomla 1.5.x. You can follow any responses to this entry through the RSS 2.0 feed. You can leave a response, or trackback from your own site.